This was the fourth panchayat poll when Shila Devi of Nayamatpur village cast her vote. The polls usually were a staid affair, with two or three candidates campaigning on bullock carts or on foot. But this year, the 50-something was struck by the dust raised by cavalcades of SUVs, all plastered with posters and packed with campaigners. Nineteen candidates from her village of 4,000 were in the fray for the post of gram pradhan. Liquor flowed freely; saris and other gifts were in plenty too. Never before did Devi see such intensity during a panchayat election. Nor did Uttar Pradesh. According to the state election commission, 92,002 candidates were in the fray for the 51,921 gram pradhan posts this year—almost double the number during the last panchayat election in 2005. “The voter turnout in the state, however, has gone down from 80 per cent in 2005 to 70 per cent, mostly because of large-scale migration and apathy towards panchayat institutions,” said K P Singh, bureau chief of Dainik Jagran in Orai, a town near Jhansi. The enthusiasm to compete for the grassroots level institutions was high. In villages like Soopa and Srinagar in Mahoba district 46 and 42 contested for the post of gram pradhan. From guitars to cup and saucers and palm trees, the election commission issued up to 50 symbols in several villages. The commission had fixed ceilings on campaign expenses for gram pradhan at Rs 30,000, kshetra panchayat member at Rs 25,000 and zilla panchayat member at Rs 50,000. This rule was rarely adhered to. As per a conservative estimate by non-profit Parmarth, each gram panchayat contestant has spent Rs 1 lakh during campaign. 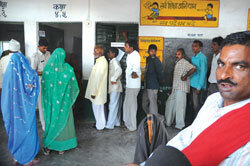 The non-profit spreads awareness about rights and duties of voters in Uttar Pradesh. “At least Rs 10 crore has gone into each district during the October 11-25 panchayat polls,” said Sanjay Singh, secretary of Parmarth. “This was the most expensive election I have seen in recent times,” he added. In comparison, contestants spent Rs 10 lakh to Rs 50 lakh per constituency during the Lok Sabha and assembly elections in the past decade. About 30 died in poll-related violence this year. The flow of funds from the Centre to village panchayats has drastically increased following the launch of MNREGS (Mahatma Gandhi National Rural Employment Guarantee Scheme) in 2005, Shiv Mangal, an activist with Parmarth, said. Panchayat posts have become lucrative and expenditure to win the posts has gone up, he added. Official sources said this year Rs 9,000 crore would be spent in Uttar Pradesh under the scheme. The allocation could be as high as Rs 3 crore a year to a big village with a population of 25,000 and Rs 15 lakh to Rs 20 lakh to a small village. “MNREGS has made the office of the village pradhan lucrative. There is a misconception that people would be able to make money once they win the post,” said Rajendra Prasad Dubey, former pradhan of Churkhi village in Jalaun district. “Hence the campaign money has reached sky high. People are hiring muscle power and using political influence to secure it,” he added. Dubey did not compete this time because Churkhi was reserved for a Scheduled Caste woman. “Despite the mandate that panchayat elections cannot be fought on political party platforms, we found candidates openly declaring their allegiance to parties in their palmphlets,” said Anil Bairwal of Association for democratic reforms, an advocacy group in Delhi. Even parliamentarians and legislatures wanted to hold balance in local governance through their kins as members and chairpersons of panchayats. The participation of people with political clout was like never before. Kalawati Devi, sister of Bahujan Samaj Party (BSP) leader Brij Lal Khabri, contested from Kaunch ward in Jalaun for member of zilla panchayat. Her brother, Biran Singh, won uncontested as the gram pradhan of Khabri village. “Last time I could not win because Samajwadi Party was in power,” said Devi. Though Devi and her brother claim they have not received any party support, villagers are well aware of their political backing. In neighbouring Dakur ward of Jalaun, of the 16 candidates contesting for the zilla parsihad member post three were with political clout: Ramphali Devi, sister of BSP MP Ganga Charan Rajput; Sishupal Singh Yadav, brother of former MLA and Samajwadi Party leader Chandrapal Singh; and Satir Ali, son of former jail minister of the state Akbar Ali. Reservation for women and scheduled castes has led to more nominations than before, said former pradhan Dubey. It has played up the caste politics of the state where the struggle for supremacy over the other is a long standing feud, he added. “The reservation has only added to the problem as now we have so many women who are illiterate and unmotivated but are standing for elections at the behest of their husbands or brothers,” said Thakur Shiv Prakash, a kshetra panchayat candidate from Chamri village in Mahoba district. “Many do not even know their symbols,” he said. While corruption and development are the rhetoric slogans of all candidates, few like Snesh Verma, a zilla parishad candidate contesting against Kalawati Devi, did have a clear agenda for their constituency. Working with Parmarth, Verma had been spreading awareness about voting. After she got the ticket, she stuck to the ceilings on expense and could not afford hoardings and SUVs like Devi. 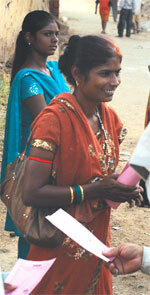 She distributed flyers and campaigned on foot with her family and self-help group members. Though not sure if she would be able to beat Devi this election, Verma is confident that she can bring about a change by making people aware. During her campaign, she requested people to vote for an efficient leader and not to be bought over by money, liquor or chicken.